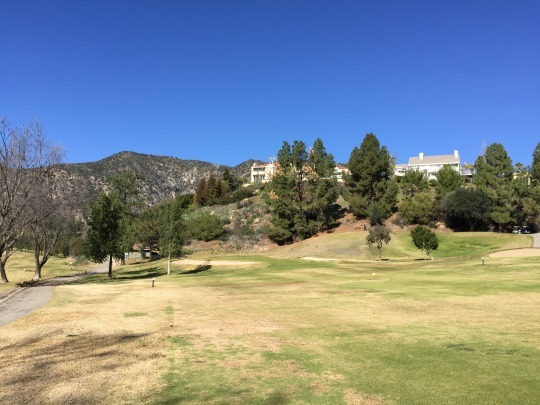 On Monday, I was able to add another Southern California private club to the list. 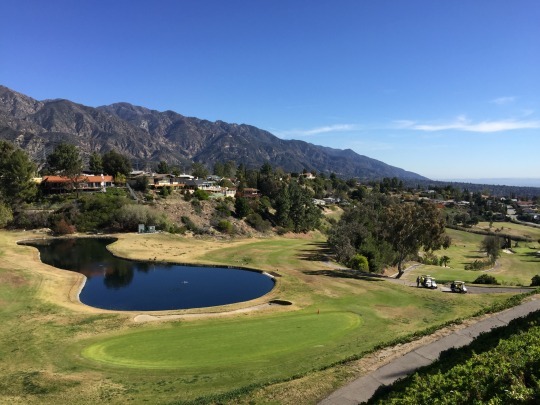 I had signed up for a “member for a day” outing at La Cañada Flintridge Country Club through GolfSouthernCal.com. It was a 9:30 shotgun start and the rate was reasonable. 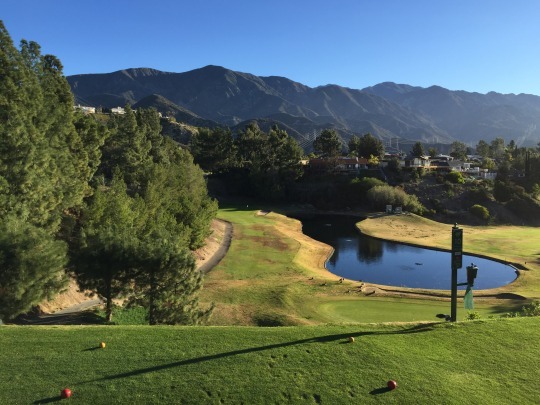 Some friends and I signed up for $60 a player, but unfortunately they later offered a $200 per foursome price, so we ended up paying more than we needed to by signing up early. Oh well. It was still a decent price. Before the round, they had some continental breakfast treats available along with some snacks and buckets of ice-cold beer, sodas and waters. Then, after we finished they had a great lunch buffet spread set out. The shotgun started pretty much on time, but there were a few slow groups in the bunch and the round took over five hours to complete. 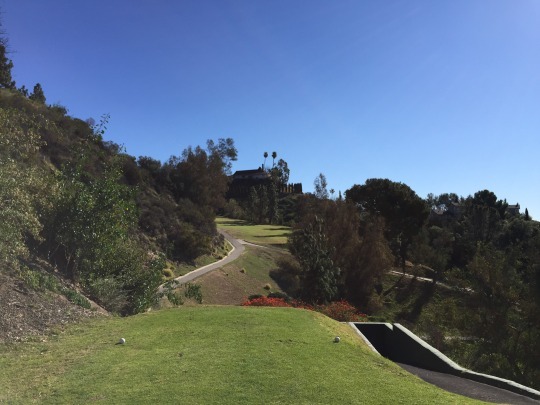 Our group started on the scenic 11th hole, which is a nice little par-3 with a fantastic view. It was a very clear morning, so we could see the Los Angeles skyline peeking through between the hills in the distance. 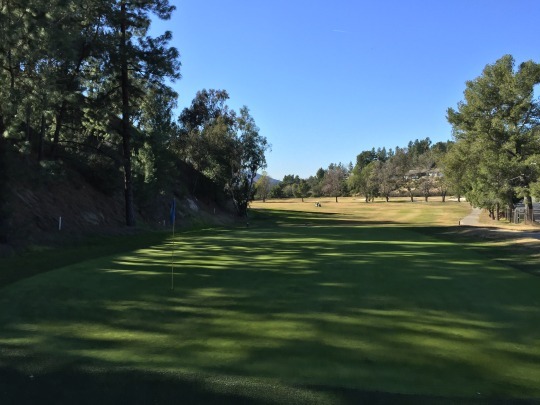 Certainly, the foothills setting of La Cañada Flintridge is one of the best qualities of the course. 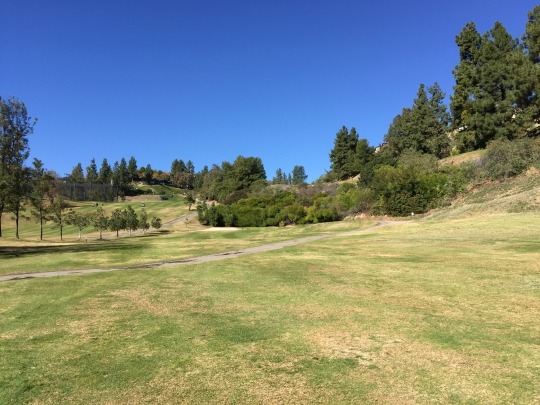 I’ve always heard it was a short, tight and hilly track, which is common amongst a lot of the older Los Angeles area courses where they did what they could with limited hillside property and minimal earth moving. 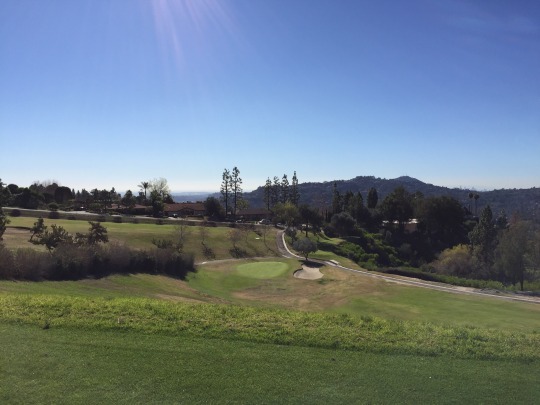 La Cañada Flintridge is “target” golf to the max. It is one of the craziest little courses I’ve played. The back nine is more extreme than the front. There are a few fairly open sections of the course, but even those holes still offer some awkward doglegs and tricky angles. 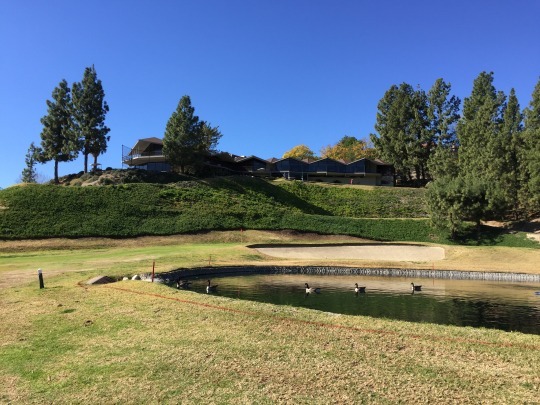 I put this course right in the same grouping with some other lower-end country club courses that might be a bit too tight and funky even for me. I normally like target golf, but there’s a point where it gets kind of silly. They are all also similar in mediocre conditioning and run-down facilities. 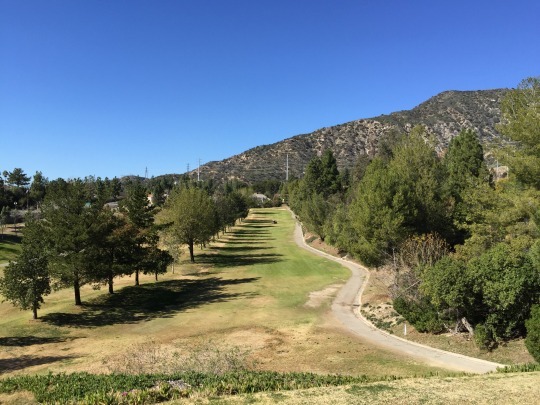 La Cañada Flintridge tops out at 5,783 yards from the blue tees and plays to a par of 70. They had four sets of tees out (blue, white, red and gold). However, the red and gold are listed with the same yardage on the scorecard, so the golds are rated for men and the reds are rated for women. I don’t know why they would bother having two different sets of tees, though. There were a few holes where the blues were about 10 yards behind the whites, but a lot of them were moved up or were just in the same basic area to begin with. 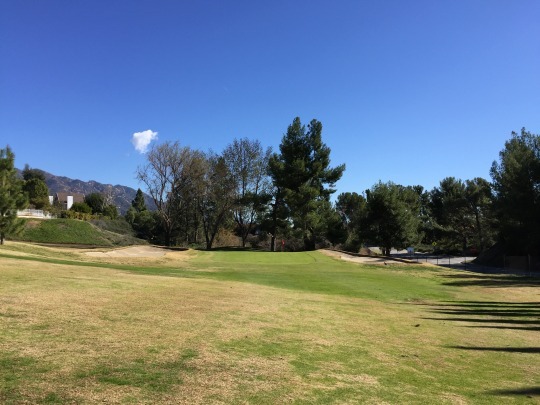 In fact, many holes had all four tee boxes lined up one yard in front of the other. You could tell the blue tees were added in at some point to “stretch” out the course. Even though the whites are listed as 200 yards shorter (total) than the blues, there really seemed to be no significant difference even if the tees were all in their proper spots. The key here is that the course is short and accuracy is vital. Many tee shots are very uncomfortable. Some require blind or semi-blind shots. Others you can see the fairway, but it doesn’t look very inviting because it’s narrow and falls off into trouble on both sides. 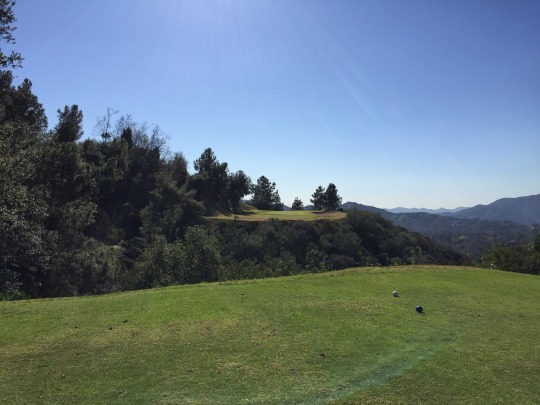 You don’t need to hit it far off of the tee on most holes. You just need to keep it safe and then you can do okay. 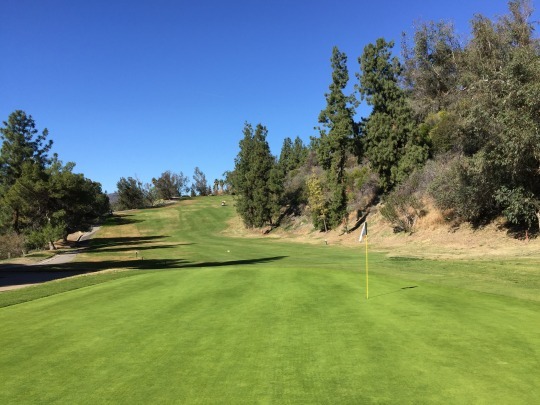 The approach shots are more forgiving with areas you can miss around the greens. The greens themselves are very small and some are rather oddly shaped, too. 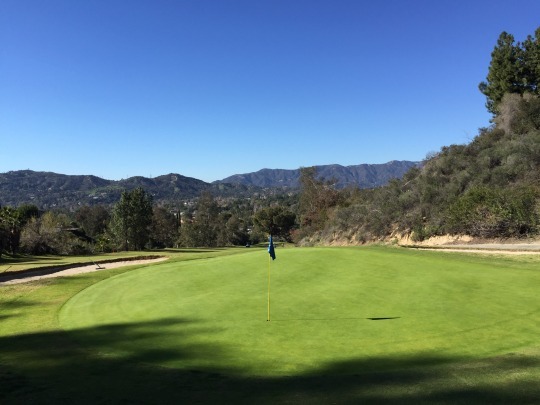 Because the course is built in the hills, the natural slopes play a large part on every shot, but especially on the greens. The breaks don’t always look too severe to the eye, but they can be treacherous. If you are above the hole here, you will not have a good time. Though the greens weren’t super fast, anything downhill was difficult to stop. 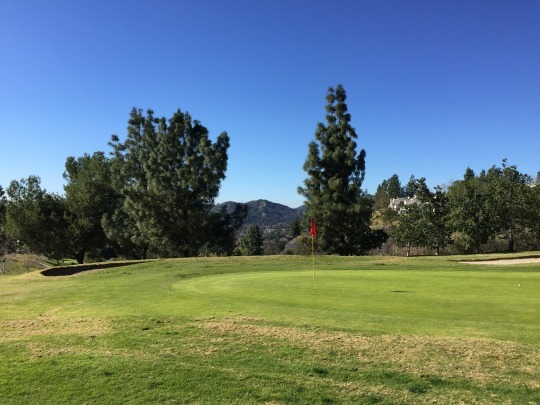 Anything uphill was tough to get to the hole and the ball would often veer sideways when it ran out of momentum. This is the kind of course that only a member could love. 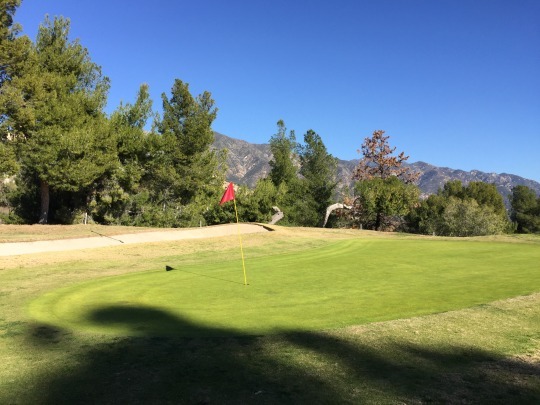 It’s certainly one you’d have to play a lot to figure out the strategies and aiming points on many holes, especially depending on different pin positions on the tricky little greens. I mentioned the setting as a selling point. The staff was also very friendly, as well. As far as highlight holes, the par-3s definitely stand out the most. 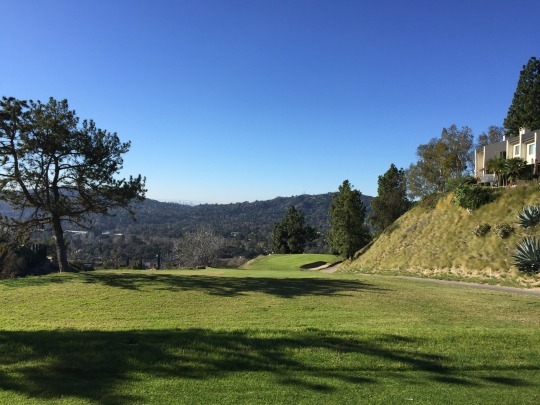 La Cañada Flintridge is a very unique layout because it starts with a par-3. It’s also quite an intimidating little hole with a hillside and trees along the left and a pond on the right. It’s a knee-knocking shot to start your round, especially for cut hitters like me. Fortunately for us, it was a shotgun and we had time to warm up before we had to play this hole. I still made a mess of it, but I felt less intimidated than when I was staring at it before the round. The 11th is a scenic little par-3 as I described earlier. Probably the highlight hole, though, is the 7th. 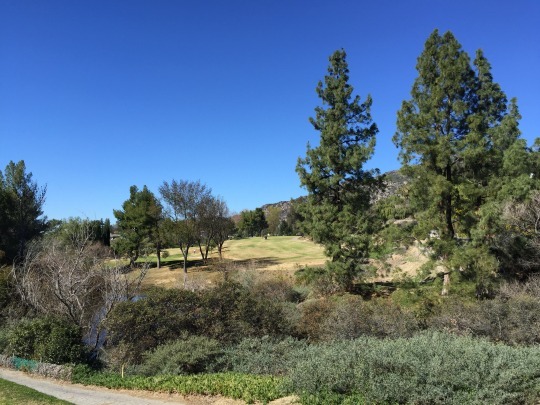 This is a fantastic par-3 playing over a canyon and offering a very beautiful setting on the western edge of the property. On the negative side, the cart paths were a mess. They were in poor condition, and the routing was extremely confusing, unnecessarily complicated at times and often quite dangerous. It’s probably not so bad when members are out here and know the routines. However, this was a large group of people who were mostly unfamiliar with the course. 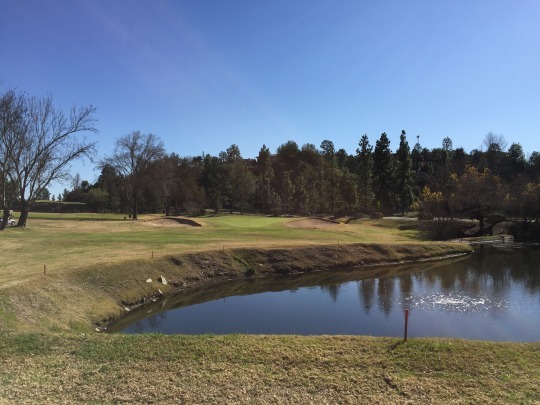 There are many places where you are teeing off and hitting next to or even right over other tees, greens or fairways. 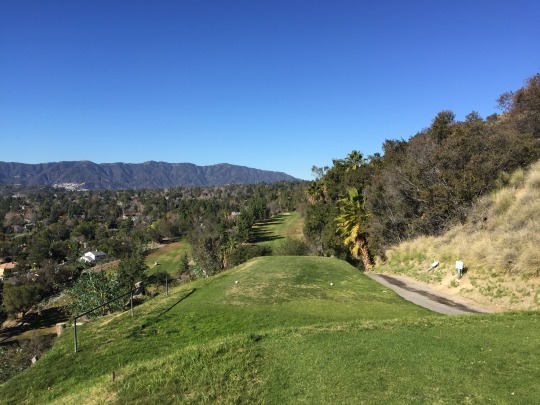 There are points where you have to drive your cart in front of the next tee and approach with great caution in case the group ahead is still up there. With all the blind shots and quirks of this layout mixed with golfers of all skill levels, safety was a concern throughout the round. The course wasn’t too pretty for winter, but it played decently. The tee boxes, fairways and rough were mostly dormant (primarily kikuyu grass) and lies were sometimes inconsistent, but never too bad. On the positive side, the sand traps had very good sand and the greens played very nicely. They rolled smoothly at medium speeds. They had firm surfaces, but were receptive to well-struck shots. 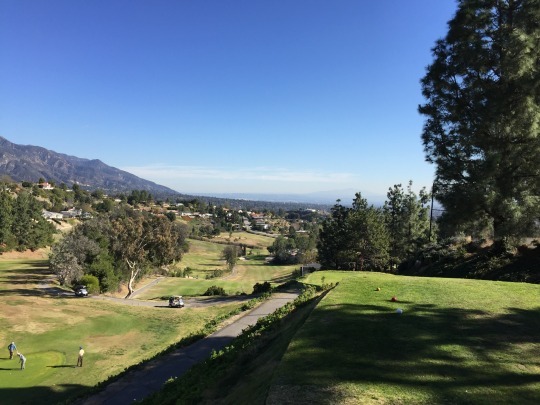 I can’t recommend La Cañada Flintridge to most players, other than to experience the craziness for themselves. It is quite an adventure. Either way, even short hitters should leave their drivers in the bag more often than not. There is part of me that wants to have a rematch now that I know more about the course and certain holes. At the same time, there’s the other part of me that is just glad to check it off the list and never give it much further thought.